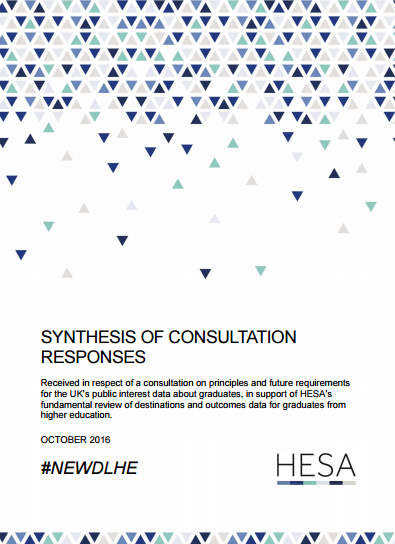 From June - July 2016 we ran a consultation designed to gain feedback on the high level principles regarding what information needs to be gathered about destinations and outcomes for those leaving higher education. You can read the original consultation here. This was a first-stage consultation aimed at gathering general views and gauging overall feedback on a range of tentative proposals. We had a very impressive 200 responses, and we'd like to thank everyone who engaged with the consultation. You can join the #NewDLHE conversation on Twitter. Update 17 October 2016: We have published our synthesis of consultation responses which provides a detailed explanation of what the consultation responses have shown. We have also published two research projects, commissioned by HEFCE to support the review.